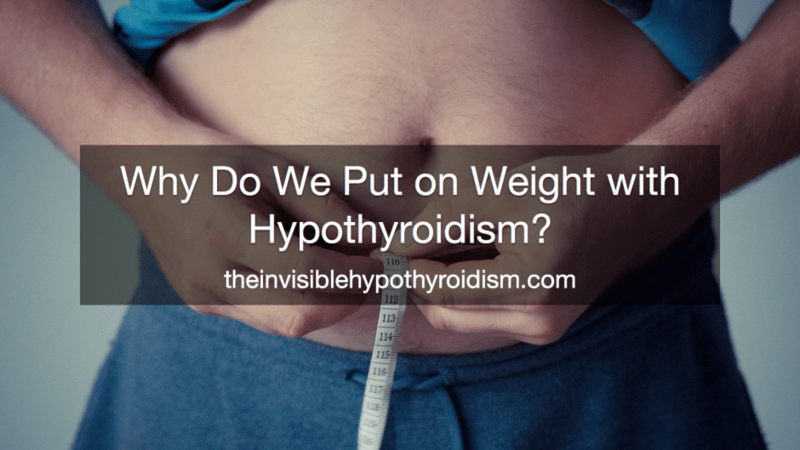 Why Do We Put on Weight with Hypothyroidism? Home » Informational Posts » Why Do We Put on Weight with Hypothyroidism? Thyroid disease is often used as a joke or a scapegoat for weight gain. People throw it around, and as such, it’s not taken very seriously. Many people think it’s just an excuse for being overweight. But weight gain is a legitimate symptom of an underactive thyroid/hypothyroidism, along with many others. Why? Ok, let’s start with some simple thyroid facts. Stay with me! A thyroid gland produces 5 hormones: T1. T2, T3, T4 and Calcitonin. These 5 hormones are needed for pretty much every process in your body, especially T3 and T4. T3 is the most active. It’s needed for every process, every cell and everything function. So when they go wrong, a lot of other stuff does too! The main purpose of thyroid hormones, produced by the thyroid gland, is to ensure the metabolism is running properly. The metabolism’s job is to produce heat and fuel. Heat to keep us warm and fuel to give us energy. Now, if we don’t have enough of those thyroid hormones I told you about, our metabolism won’t work properly and so can’t provide us with adequate heat and fuel. Therefore, people with an underactive thyroid or hypothyroidism have a slow metabolism, so will have symptoms associated with a slow metabolism, such as cold intolerance (from the lack of heat made) and extreme tiredness and weight gain (from the lack of calories burned to make energy). Medical professionals seem to think that the weight gain from hypothyroidism is usually between 10 and 30 pounds (what two GPs said to me), thinking that the body adjusts for the slower metabolism after while. This is very much disputed, though, as many patients carry on gaining, despite a low calorie diet. It can be one of the most distressing and frustrating parts of being hypothyroid. I gained 27.5 pounds. So shouldn’t the weight gain stop/come off when you start medication? Ideally, yes, but not always. It all depends on what medication and dosage the patient is on. Remember those 5 thyroid hormones I mentioned above? Well, we need to replace them, since the under active thyroid isn’t making enough. There is synthetic T4-only medicine, which obviously only contains synthetic T4. There is T3-only medicine, which only contains T3. There is Natural Desiccated Thyroid (NDT), which contains all five; T1, T2, T3, T4 and Calcitonin and is made from actual porcine gland. Which do you think has the highest success rate? The one that gives us all the hormones we need, right? Well, doctors will dispute this. Doctors prefer T4-only meds and very rarely prescribe the other two, even though they are available on prescription. Why? Well, that’s up for debate. You can read a bit more about why here. Basically, NDT was used for many years until it fell out of favour due to a complicated history, at the same time that synthetic T4 was introduced. The result? Many patients end up on t4-only synthetics, like Levothyroxine and Synthroid, and still feel rubbish, because they need the other hormones too. In theory, T4 should convert in to T3, and that’s why doctors refuse to believe that T4-only medicine doesn’t help us. But a lot of people can’t convert the T4 in to T3, so the medicine doesn’t work for them. When they change to NDT, or add T3 to their T4, they usually end up making huge improvements. Like me. For patients kept on a medicine not working for them, or too low a dose, this means they are kept hypothyroid, inadequately treated, and so their symptoms get no better. – If not worse for a lot of patients! Because of this, their metabolism is still rubbish, so they experience weight gain and inability to lose weight. Along with many other hypothyroid symptoms. I have a naturally really large prominent thyroid. Many doctors have checked it, but they never actually show me the full results! I suspect that it’s showing low levels on some of T’s….but not the ones they commonly treat in the UK. I have a Fibromyalgia diagnosis, and am now suffering from unbearable fatigue. I’ve put on around 3 stone in weight. I can (and before our wedding 2 years ago, did…) lose weight following Slimming World, but it’s only a very little at a time (like half a pound) and I have to be ridiculously strict. One treat, off-plan meal….I’ll gain weight. I’m a bit at the end of my tether at the moment, after a sleep study shows no…I don’t have sleep apnea to explain the exhaustion. I really think it could be my thyroid. What test should I be asking for? So sorry to read about your struggles Lucie. 😔 I would start by getting a print out of any tests so you can begin with the knowledge of what you’ve already had tested. The full thyroid panel consists of TSH, Free T3 and T4, Thyroid Antibodies TpoAB and Tgab and Reverse T3 (though extremely uncommon to successfully get done). I would be looking at your free t3 mainly to begin with and checking it is optimal (not just in range). If you haven’t already, feel free to join my Facebook group Thyroid Family. Over 36,000 members willing to help and support you further.